Bring all the fun of the fair into your own home with the Elgento Popcorn Cart - a fantastic little appliance that's great for parties! 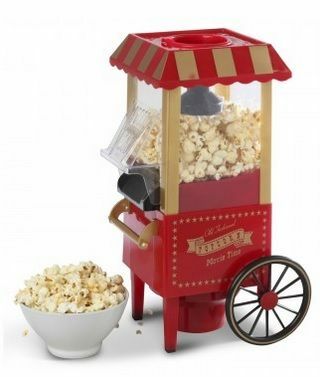 Featuring a classic fairground cart design, this playful, portable popcorn producer will have you cooking up light, airy and delicious popcorn within minutes of opening the box. Simple to use and even easier to clean, the Elgento Popcorn Cart offers healthy, oil-free cooking and is perfect for movie nights at home.